Arsalan Iftikhar is not an unfamiliar name in Balochistan as well as in Pakistan. He has been on centre stage of controversies since March 2007 when his father, former chief justice Iftikhar Chaudhry, was sacked by Musharraf. That was just the beginning and now once gain Arsalan Iftikhar is the main character of a controversial decision made by Balochistan Government. When Musharraf sacked Iftikhar Chaudhry as chief justice in 2007, He used the case of Arsalan Iftikhar as an example of abuse of power. Arsalan Iftikhar is a medical doctor and he was employed in Health department of Balochistan. Allegedly, upon pressure from his father Government authorities in 2005 first send him to Federal Investigation Agency on deputation. After that, he was inducted in Police Service of Pakistan bypassing Federal Public Service Commission. The vibrant lawyer’s movement led to restoration of Iftikhar Chaudhry as chief justice and the case of Arsalan Iftikhar was forgotten. 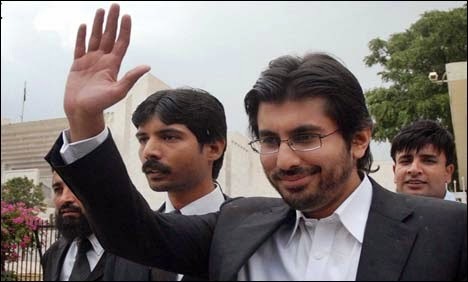 After a hiatus of five years, Arsalan Iftikhar was again a part of controversy along with Malik Riaz in 2012. Again it was alleged that Arsalan Iftikhar had received bribe from Malik Riaz to influence his father to give judgments in favour of Malik Riaz. That controversial episode garnered a lot of media attention and after some months the controversy settled down after a deal. Arsalan Iftikhar can be called controversial at best. Surprisingly, one day, it’s announced that he has been appointed as Vice Chairman of Board of Investment of the resource rich but backward province, Balochistan. It was shocking news for the followers of Balochistan politics as no one was contemplating this appointment. Now, the points to ponder are that what Balochistan government saw in Arsalan Iftikhar? Was there no one else for that job? Could not they find someone with a clean track record? The answers of these questions prove one thing and it is that Arsalan Iftikhar was chosen for the job based on someone’s recommendation. It’s believed that Dr. Malik, Chief Minister Balochistan, was against this decision but he had no option but to comply. This doesn’t exonerate Dr. Malik from the flawed decision of choosing Arsalan Iftikhar for the sensitive job in board of investment. The main reason behind formation of board of investment was to lure foreign investment in Balochistan projects most notably Reko Dik. Reko Dik is a gigantic copper gold project in Chagai district of Balochistan which is estimated to be worth $ two trillion. Board of Investment of Balochistan has to make the decision of choosing the company which will get the right to invest in Recodiq. This makes the portfolio of Vice Chairman extremely sensitive. Since, Chief Minister is Chairman of this board and he will be busy with other matters, Vice Chairman will call the shots. Appointing a controversial person to such a sensitive position has put the precious natural resources of Balochistan at grave risk. This decision has effectively jeopardized the plans of economic prosperity of Balochistan through exploration of mineral resources. Since assuming office, Dr. Malik and his cabinet have claimed to be flag bearers of merit. They boast about controlling the rampant corruption in Balochistan which thrived during the Government of Nawab Raisani. Thousands of jobs promised in last year’s budget were not advertized due to concerns of appointments based on favoritism. Amid such claims, this government has committed the blunder of appointing Arsalan Iftikhar at a sensitive position in Board of Investment. How the claimants of merit can justify this action? All the claims of upholding merit by Balochistan government have been washed away in one stroke when Arsalan Iftikhar was appointed. Moreover, there is a general belief that Dr. Malik was pressurized to make this decision. This is one more instance of how powerless Dr. Malik is as Chief Minister. Being powerless is not an acceptable excuse for being part of a wrong decision. Whoever was behind the decision of appointment of Arsalan Iftikhar, ultimately it’s Chief Minister Dr. Malik who will shoulder the responsibility. This appointment also means that the culture of favoritism and practice of appointing unqualified persons is continuing unabated which is not good for deprived people of Balochistan. Balochistan is a turbulent province and the incumbent government was considered as a hope for change. The hopes have died down long ago and the last one year performance of government has not brought any change in the lives of people. The appointment of Arsalan Iftikhar is fundamentally a bad decision and all political pundits have condemned it. It would be interesting to see that how the government ministers and their supporters would defend this decision which is certainly un-defendable.